BRAIN COLLEGE brain trainer V1.02 + New WM6.x version. 'WARNING!!' This one is even more fun and addictive! 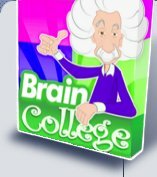 Brain College follows on from Brain School and throws you in at the deep end with 20 new brain games! Once again you'll feel a buzz between your temples as you work towards graduation day. Okay we admit it, you may just be tempted to spend most of your time in the 'Common Room' rather than studiously knuckling down to subjects such as 'English' and 'Physics'. You have been warned! Can you graduate from Brain College ? A few more screenshots ... there are 20 different games + 4 types of test and progress reports. Once again you can check your improvement in mental agility every day! Just remember, as in real life, College is harder than School. Are you sure you are up to it? Square, Portrait, Landscape, VGA and QVGA support. Brain College is a worthy successor to Brain School. Even if you haven't played the first one, however, there is still a lot of fun to be had here. With 100 levels and 4 exams to beat to 100% complete the game, Brain College should keep you busy for quite some time. Even if you don't choose to complete every level, there's still much to be done to finish all 4 years at a minimal level. It's time to get your thinking cap on and enroll in Brain College. Guaranteed Tingles in your Temples. Loads of fun and yet it is good for you! You go to the gym to train your muscles; why not train your brain too! Sports Day, Classroom Cleanup, Art. Futoshiki and fifteen more! Daily test to monitor your progress. Pick up and play but will take many months to complete. Twenty different types of puzzle. Pass your Year 4 finals to graduate! Vast variety with everything from Physics to a Common Room. Great for kids and adults alike! QVGA, VGA and Square screen compatible. PPC 2002, WM2003, 2004, WM5 and WM6 compatible. iPhone / iPod Touch (Coming soon). NB The WM6.x version uses .NET CF3.5 which you can install HERE.